Workers view Bertha’s cutting head, lifted to ground level for repairs. With a probable legal battle brewing, officials fear the project’s Expert Review Panel poses a financial risk. As the state of Washington and its Highway 99 tunnel contractors careen toward litigation, the Legislature has suddenly scrapped the panel that monitors the project. The three-member Expert Review Panel (ERP) is the only source of oversight in the $2 billion project that combines independent members, megaproject experience and nearly unfettered access to debrief the tunnel’s executives and senior engineers. But leading lawmakers fear the panel’s work could expose the state to financial risk. 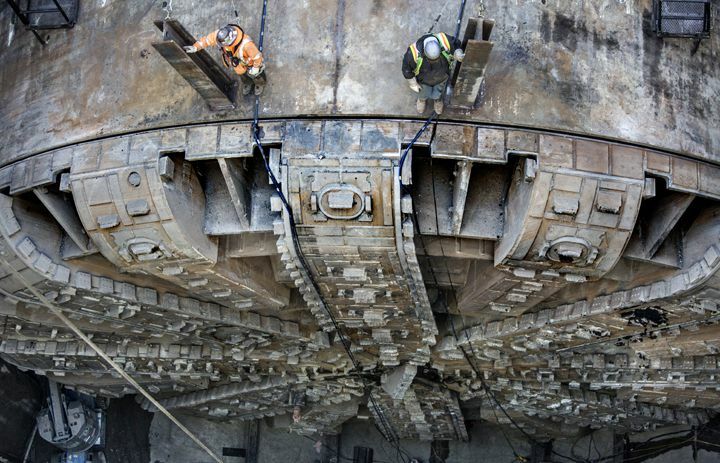 The project is running nearly 1½ years late after tunnel-boring machine Bertha broke down in December 2013. “To have an ongoing three people who are out making opinions which are public — I felt that could hurt taxpayers,” House Transportation Committee Chairwoman Judy Clibborn, D-Mercer Island, said Friday by phone. Instead of funding a panel that offers technical and financial perspective, lawmakers would hold their own committee meetings to seek information from project leaders. Under the design-build project method, Seattle Tunnel Partners (STP) is supposed to do final engineering and building under a $1.35 billion contract and be fully responsible for costs, except for those prompted by surprise soil conditions. If the Washington State Department of Transportation (WSDOT) blurs the line, by telling STP how to dig, that might put WSDOT on the hook for problems. A professional distance exists. For instance, WSDOT says it doesn’t possess a copy of the warranty for the tunnel-boring machine, which was built by Hitachi-Zosen in Japan and is now undergoing repairs. The four-lane tunnel is expected to be done in early 2017, and STP has filed change-order requests exceeding $220 million. The expert panel’s latest report, on April 3, revealed the total could reach $293 million. If the two sides can’t agree on who pays what, the courts would ultimately decide. Gov. Jay Inslee and three other lawmakers also forwarded remarks to The Seattle Times late Friday. Clibborn said lawmakers this spring began to worry about legal exposure, then sought advice from state counsel before deciding to retire the panel as of July. For her, a red flag was learning that the panelists were communicating with Seattle City Council members, which she felt went beyond their scope. But panel Chairwoman Patricia Galloway, of Cle Elum, said Friday she’s been given no rationale. Galloway, a former president of the American Society of Civil Engineers, said the panel has interviewed the same stakeholders for four years, and she doesn’t understand Clibborn’s notion that the panel is creating risk. Asked if the panel provided helpful guidance to WSDOT, Peterson would say only that the decision was made by the Legislature and governor. The panel, convened by then-Gov. Chris Gregoire in 2011, worked impartially and is unaware of complaints from either WSDOT tunnel managers or contractors, she said. The two other panelists are John Rose, retired chief executive officer of Seattle-Northwest Securities; and Robert Goodfellow of Washington, D.C., an engineer and current board member of the Underground Construction Association. Oversight is a sensitive issue for taxpayers. 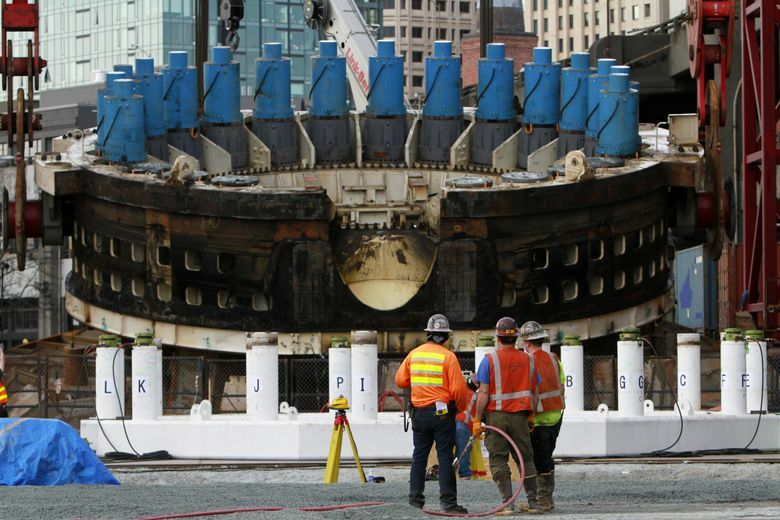 Bertha, the world’s largest tunnel-boring machine at 57 feet, 4 inches in diameter, is undergoing repairs in the wake of a stall Dec. 6, 2013, when parts of the main bearing assembly ripped apart and overheated. It may take years before the public learns whether construction companies, their insurance plus $124 million in state contingency funds will cover the losses — or whether drivers will absorb tunnel cost overruns at the gas pump. Clibborn said she has no gripe with the panel’s findings, and she notes that its April 3 report overall looked good for WSDOT. The panel expressed confidence the 1.7-mile tunnel being built to replace the Alaskan Way Viaduct can be funded without further squeezing taxpayers. The state would need to reduce costs to rebuild surface streets along Elliott Bay, collect late fees from STP, and recoup insurance money. On Friday, Galloway credited the panel with helping the relationship improve. The budget still contains language saying the expert panel should serve until substantial completion of the tunnel — but Clibborn said committee leaders changed their minds. Panel expenses might be an issue for lawmakers, though not a big piece of the two-year, $5.6 billion transportation budget. “We want to avoid adding extra layers of bureaucracy by extending the panel beyond its original mission,” wrote Rep. Ed Orcutt, of Kalama, ranking Republican on the House Transportation Committee. Galloway said she’s being paid $200,000 over two years to lead the committee, whose current contract wasn’t immediately available. This is a separate group from the dispute review board, which holds closed hearings and makes recommendations. So far, it has said the state should have warned contractors about a leftover steel pipe that Bertha hit; that WSDOT should be on the hook for groundwater flow into the Sodo launch pit; and that STP should fund extra reinforcement of the viaduct. None of these three findings was accepted by the losing side.